How do you wear Stone Island without going broke? How can you get hold of that special badge without breaking the bank? FACT: Stone Island don’t sell badges. FACT: buy from eBay or Gumtree and you get fakes galore. Have you got £1100 to spare? If so, then buy the jacket below – a snip at £1095 at Farfetch – with the remaining £5, you can buy yourself a greasy kebab after the football match. So, how does one wear ‘cheap’ Stone Island – while still keeping up that impression and appearing to be part of the gang? Buy fake. eBay (AKA Fleebay/Dodgy Kingdom for Fakes/Scammers Paradise). If you have mates who don’t wear Stone Island – they won’t know the difference. And you’ll be prince charming. But erm… if you’re mates know Stone Island… don’t… DO NOT… I mean DO NOT buy! The fakes are just so pathetic. You can spot a mile and a half away. You’ll be laughed at and become a joke! eBay – buy used: yes, you can actually pickup a bargain – but the real clobber really holds it’s value. And don’t bother relying on the Certilogo – that’s hit and miss – like you HAVE to have the item in your possession AND have bought BEFORE they will tell if genuine or not. Pathetic guys. Make your system better. BEST TIP: buy a nice Stone Island Polo tshirt. Mix and match with other items. You’re still part of the crew. A genuine SI Polo tshirt will cost you £110 – or roughly $140. Hunt around and you can pickup for £40 – £50 ($60 – $75). Jeans: relatively cheap at £195 (well compared to the price of a jacket it’s cheap!). Remember, it’s just some denim with the special ‘Stone Island Badge’ on – take the badge of and no one blinks twice when they see you wear. Buy a Stone Island wooly hat. A snip at £75. Best worn in summer – but because of the heat, wear on your head and go round with nothing else on – underpants, shoes, socks and trainers are optional. Avoid Gumtree for used or new. 99% chance it’s a dodgy crappy fake. Buy off season and wait for sales. That £1095 jacket above will be on sale for £795 in 12 months time. Ahem… well… that’s a heavy discount if you think about it. Crazy Idea: buy a badge and stick it on ordinary clothes. Ting!! You have a ‘Stone Island’ piece of clothing right? Well… not quite – it’s not that easy my friend – you need to be a ninja sewer with expert eyesight when sewing – skills old women take a lifetime to master. You have to know how to sew. The buttons are strategically placed and well sewn in. Make a bad job and you’ll stick out like a sore thumb – and you’ll mess up the arm. You can’t JUST stick on a crappy jacket bought from Primark. Stone Island clothes are well sewn. They don’t fall apart. Sewing onto a jacket through the arms is actually demanding! 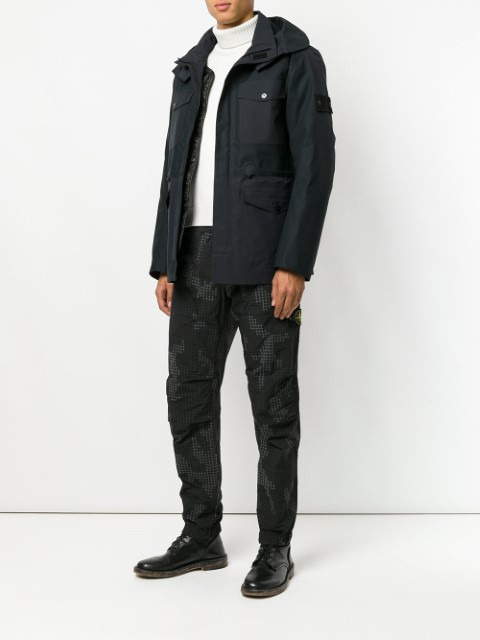 Previous post: How much would you pay for used Stone Island clothes?